again. After a good hiatus. And am loving this new show. We had a rollicking but grueling schedule last week after which I thought I was ever going to feel my feet, what with all the standing in stilettos all the while. Nevertheless, it was a super fun schedule and shall keep thee updated on what the show is and when it shall be aired and on which channel. எனக்கு மட்டும் அந்த ரகசியத்தை சொல்லுங்களேன்! Hi, Welcome back !! !, It will be great watching you rocking yet again !!! cant wait! All the best! congrats missed your presense on TV alot which channel is it? & program? 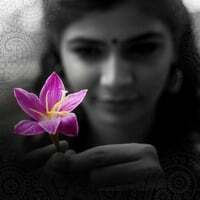 Hello Chinmayi,I have always loved your voice.I respect you for the charisma you carry with you.Recently I read about how you were home schooled for higher secondary and also about the various fields you dabbled in right from a young age(like how you were a translatoe for sify). I saw myself in a sitution which unfortunately did not present itself in my life. I have always wanted to be a radio presenter and dubbing artiste ever since people started about how "soothing" my voice is! But a myriad of factors acted against my wishes and made me a chemical engineer leading a prosperous yet uninteresting life. I feel very happy for you,for what you have achieved and for the personality you possess. Hope you will enthrall ur fans for years to come. Anyway got the summary... :) grt to c u back on tv!!!! Welcome back to the Small Screen! That's great..been missing u on TV. Hello mam....I found that!!!! "Music Ka Maha Muqabla's" Tamil version will be having you as the host...Congrats!!!!! See you there.....But in what channel? is it for Vijay tv ? we are with you.. rock it..
Nice! Will be good to see you on TV after a long time. Lemme guess, you are going to be on Jaya TV. Yea. keep us updated re.. waiting to see yu back on stage hosting a show ! .. Yu carry it so well.. Best of luck ! I know it is for "Airtel Super Singer" :-) in Vijay TV.....Am I correct? Welcome back! Been a fan since the time you were a contestant singing 'Singaara Velane'. Glad to see that there isn't so much BS in the industry (as you claim in your interview) that it stopped you from what you have deservingly accomplished today. Keep rocking in whatever you do. Will pray that you find more laurels come your way. Waiting to see you in T.V. i Think its after Airtel super singer ses 1 your back to T.V. Let it be ASS3 please. U Rock ! It is on SunTV. Will be aired from 26th June. Congrats Chinmayi. You are on the number one channel! Wish u Godspeed!